It’s got the oldest Chinatown in North America, is famous for its sourdough and boasts fresh catch that tastes like it’s come straight from boat to grill. Unsurprisingly, the food in San Francisco is pretty damn good. The only trouble is, there’s so much of it. Faced with a paradox of choice, we relied heavily on the recommendations of friends and locals to find restaurants to suit us. 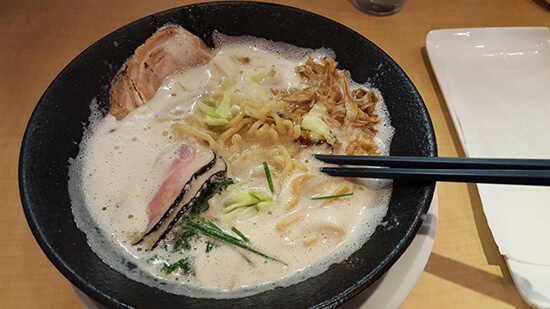 We ate fish and chips at Cioppino’s in Jefferson Street, Fisherman’s Wharf, queued for an hour for Mensho’s famous ramen in Geary Street, Union Square, and got garlicky at Columbus Avenue’s Stinking Rose – all of which were fantastic. Compared to the 50-degree melt-worthy heat we’d encountered at the Hoover Dam, San Fran was a delightful 20ᵒC. The sea breeze gave us the cooling off we needed after spending a few days overheating on our journey from Phoenix (via the Grand Canyon, Vegas and Yosemite) to the City by the Bay. It was a 20-minute stroll along Pier 39 before we actually reached the sea lions. We had started to question whether they even existed; until we heard their boisterous barking that is. It’s easy to see why people call them the dogs of the sea. These fascinating marine mammals took up residence here in early 1990, after the Loma Prieta earthquake, and haven’t left since. 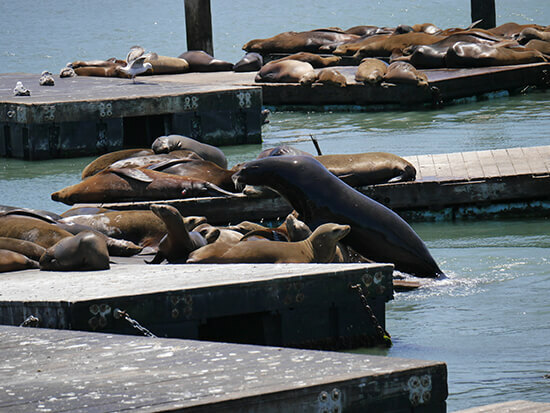 We spent nearly an hour watching them as they hopped from jetty to jetty, basking in the midday sun, not in the least bothered by the crowds of humans that ogled them, captivated by their bizarre behaviour. I must’ve snapped well over a hundred photos of them flopping into the water and jumping back on top of their jetty-mates when they wanted to dry off. For me, wildlife and places of significant history are the reasons I travel. So when the two are compared it’s usually hard for me to pick one over the other… but then Alcatraz came along. It didn’t have to work very hard to be my favourite aspect of San Fran. After doing plenty of pre-trip research, we embarked on the early bird cruise at 8.45am, which meant that we were part of the first group at Alcatraz Landing that day. 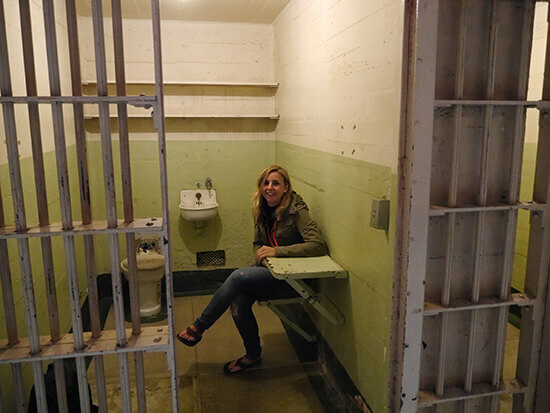 But that was the idea; it meant that when we explored the haunting cell blocks, we did it without hordes of people peering through the same bars as us. The island was gloomy (not helped by the ominous grey cloud cover that morning) but fascinating; to us it felt like nothing had changed since the prison closed its doors in 1963. A preserved time capsule, we stared into the mortuary, walked the cold floors that stretched around B & C block, wrapping around into the cells in D block, and memorised the daily prison menus in the dining hall – all the while morbidly compelled to learn about all the different inmates that were sent here. We took pictures of the solitary confinement cells, where Robert Stroud – aka the Birdman of Alcatraz – spent much of his time, and the various cells that incarcerated the infamous Al Capone. It’s not often that all the history is so accessible, but in Alcatraz there were informative plaques and boards at many of the cells, accompanied by the best audio tour I’ve ever had the pleasure of using. Usually I discard the cumbersome headphones and playback device fairly sharpish when visiting any attraction, but these ones stayed on for the duration. 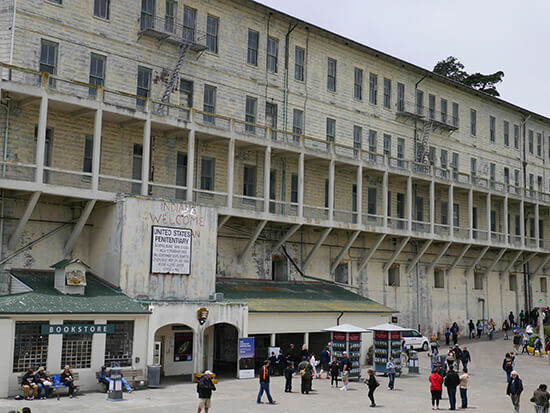 You get to hear from the guards who worked there, as well as the inmates, giving you a first-hand snapshot of what living on Alcatraz Island was really like. 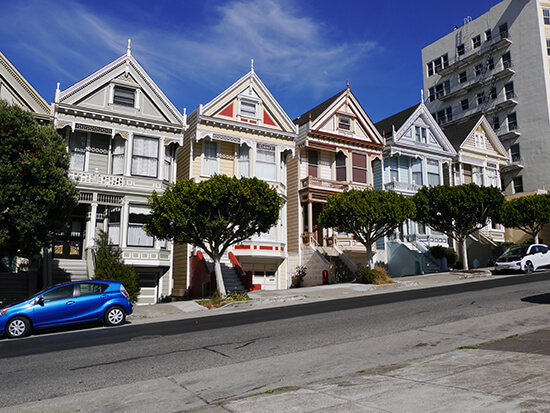 Lombard Street, the Painted Ladies, Union Square, the Palace of the Fine Arts: we tried to tick off all the photo-worthy spots we’d seen on TV and in the movies, but it was tough work with just three days to play with. 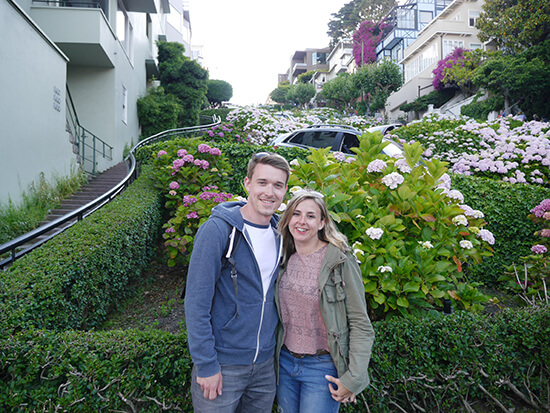 Lombard – billed as “the crookedest street in the world” and located in the Russian Hill neighbourhood – was the one that fascinated us the most. 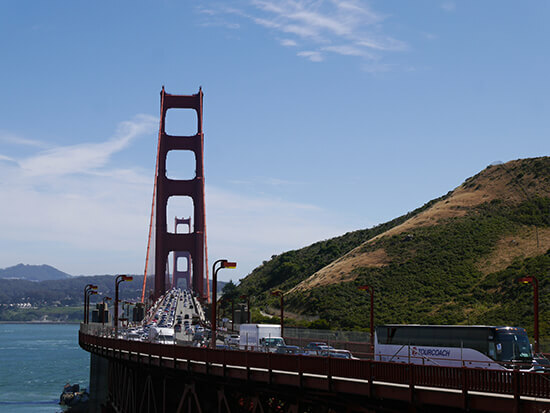 With its eight hairpin turns on one of San Fran’s steepest hills, it was certainly a must-see. 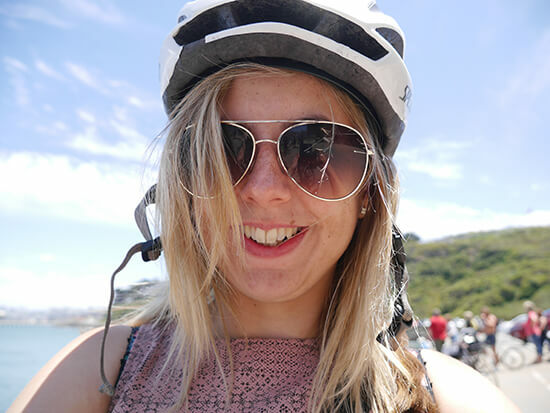 Before we went to San Francisco, I’d only ridden my bike three times in about 10 years. Now we’re back home, I can’t get enough of it. That’s because flying across the Golden Gate Bridge on two wheels is the stuff of cycling dreams. We picked up bikes in Fisherman’s Wharf and rode from there, stopping to catch different views of the bright red metalwork of the bridge as we went; not to mention the beach and park below. Riding across the bridge itself was undoubtedly the best bit. We rang our bells for no reason like children, and felt sorry for all the passing motorists who had no idea how freeing and refreshing it was to cross this beastly overpass under your own steam. 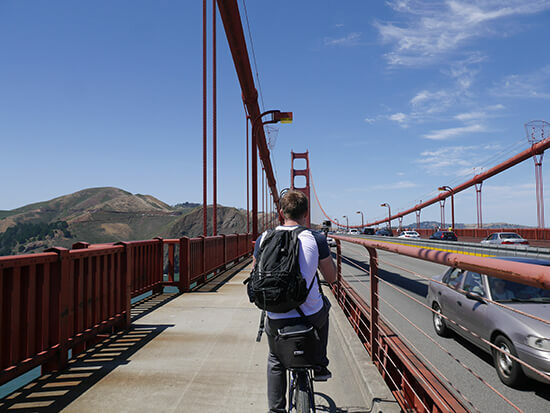 With our pedal power in full swing, we reached the other side and locked up our bikes to take in the aptly named Vista Point, which offered views of the bridge and the city in tandem. It took us over three hours to complete the return trip, but we felt invigorated at the end. One of San Francisco’s most beloved icons is its historic cable car system – the last manually-operated network of its kind in the world. It’s mostly used by tourists because of its hefty price tag (US$7 for a single ride! 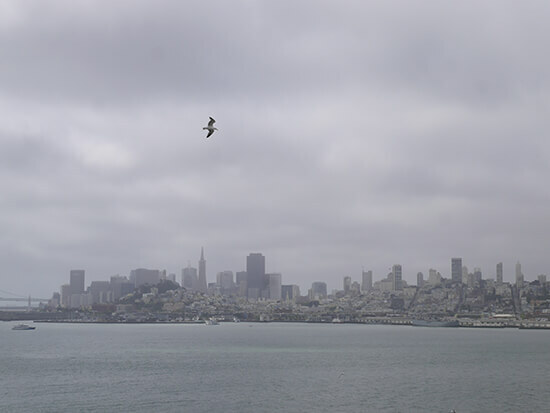 ), but we had the San Francisco CityPASS which gave us unlimited trips. Completely worth the investment. We rode the Powell-Mason line (one of three lines: Powell-Hyde, Powell-Mason and California St) all the way from Union Square to Fisherman’s Wharf at least five times and, on the last, rather early morning, ride, it was quiet enough for us to hang off the side. We were living the 'Frisco dream. My now fiancé, Brad, may have got down on one knee in New York City, but San Francisco is where we got the ring, and that’ll always stick with me. 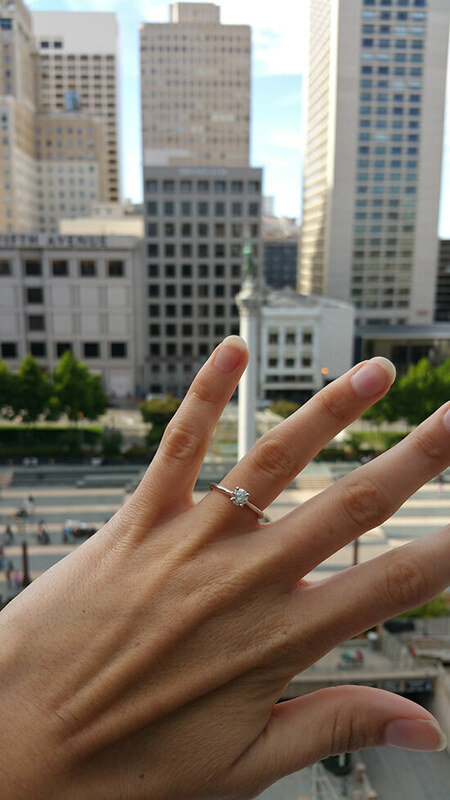 I don’t often take pictures of my hand, but this moment at the top of Macy’s in Union Square, just after I tried the ring on for the first time, was an exception. 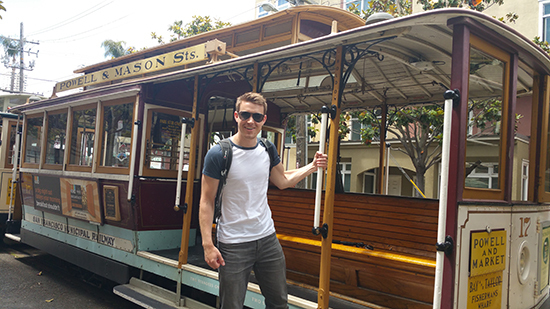 Alex and fiancé Brad explored San Francisco on a customised version of our California & Canyons Journey, staying at the conveniently-located Handlery Union Square Hotel for four nights. 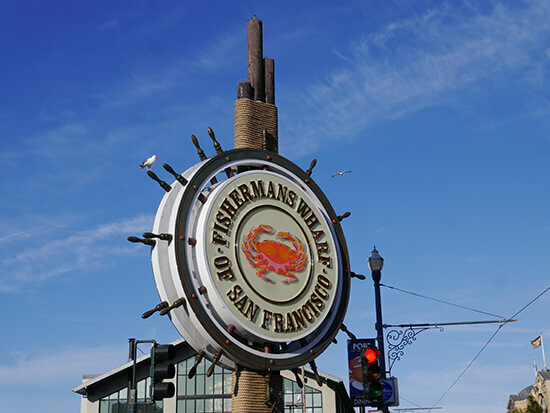 To replicate their trip, check out our range of tailor-made San Francisco holidays.